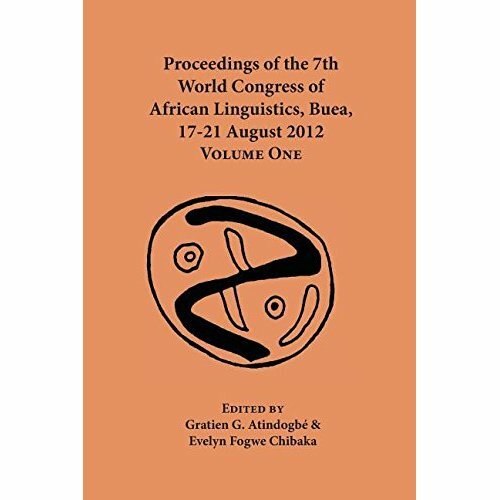 Abstract: This book is the fist of two volumes bringing together 40 papers on African linguistics presented during the Seventh World Congress of African Linguistics (WOCAL7) at the University of Buea, Cameroon, in 2012. Volume I is divided into seven chapters: I. Plenary Paper, II. Borrowing, III. Discourse Analysis, IV. Historical Linguistics, V. Intercultural Communication, VI. Language Documentation, VII. Language in Education. The papers are in English or in French. The Plenary Paper, by Ekkehard Wolff, is entitled 'Language planning and policy implementation in Africa: whose job, and how to go about it?'. Other contributions by: Bertille Djoupee (on borrowing in Baka); Joseph N. Mfonyam (on African proverbs); Iwuchukwu C.S. Godwin (on Igbo proverbs); Virgina Beavon-Ham (on information highlighting in Aja (Kwa)); Cameron Hamm (on semantic classification in Bafanji); Russell Norton & Thomas Kuku Alaki (on Torona of Sudan); Doreen Schröter, Britta Neumann & Roland Kiessling (on expressions of disapproval in cultures of the Cameroonian Grassfields); Lydie Christelle Talla Makoudjou (on symbols and communication in Ngemba); Avoa Mebenga Geneviève Sandrine (on language usage in Yaoundé markets); Gabriel D. Djomeni (on revitalization of endangered languages); Emmanuel Ngue Um & Daniel Duke (on language documentation of Bakola (Cameroon)); G. Tucker Childs (on Bom and Kim (South Atlantic)); Blasius Agha-ah Chiatoh & Judith Fonyuy Moye (on multiple dialects standardization in Cameroon); Sam Lutalo-Kiingi & Goedele A.M. de Clerck (on sign languages); Henry Tourneux & Hadidja Konaï (on African languages at school); Hussein Mohammed Musa (on Silt'e as medium of instruction); Julia Messina Ndibnu (ethnolinguistic minorities and public institutions in Cameroon); Maxime Yves Julien Manifi Abouh (on Yambetta (Cameroon) as language of instruction); Yamina El Kirat El Allame & Karima Belghiti (on attitudes towards Moroccan languages as languages of instruction). [ASC Leiden abstract].